Every scroll saw user will benefit from this book I've created. I start at the beginning with the mechanics of scroll saw itself, then continue with the basic skills every scroll saw user needs for a fun and successful hobby. In the process, I'll share secrets for maximizing the capabilities and efficiency of the saw, showing you how to customize your new or old saw to work like a charm. I'll also cover the selection of wood, the creation of patterns, and the basic techniques of scroll saw use, all with clear, step-by-step instructions illustrated with full color photographs. Plus 16 original patterns included. One of the joys of scroll sawing is creating pictures in wood. An interesting design plus two or three colors of wood combine to make a piece of art of which one can be proud. 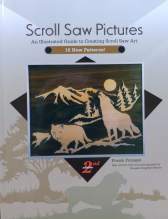 So I created this step-by-step book so you too can create wonderful scroll saw pictures. Using designs of my own and other talented artists I'll teach you all you need to know about this wonderful craft. Color photographs illustrate each step and a gallery will give you plenty of ideas about how to utilize this art form. Many patterns have been provided for additional work. This book will give you step-by-step instructions to create your own 3-D Santa sleigh and nine reindeer, complete with the instructions on giving Rudolph a flashing red nose and installing a music box that plays "Rudolph The Red Nose Reindeer." The easy to follow guide is illustrated in full color, and accompanied by 30 tree ornament patterns. The selection of wood, the application of patterns, and the basic techniques of 3-dimensional scroll saw work are covered, all with clear, step-by-step instructions illustrated with full color photographs. This project is challenging enough to hold a veteran's interest, yet simple enough that a novice scroll sawyer should be able to get great results. and with a little hand carving and a touch of paint they come to life. I've included a short step-by-step guide, illustrated with color photographs, to introduce the use of the scroll saw for 3-D work. There is also a gallery with examples of many cut items, showing them in various stages of finish, rough and carved, natural and painted. This wonderful book has all you need for a great 3-D experience. This book offers the scroll saw artist some innovative and beautiful ways to use the tool to make ornamental, three-dimensional designs. After cutting, the pieces come apart so that they can be set to in various creative arrangements. Each pattern has several uses, from decorating a pen holder to simple puzzles for children. By using different color woods the possibilities become limitless. This book has easy-to-follow directions for one of the patterns, with each step illustrated with a full color photograph. Patterns for 30 additional projects are included. A gallery explores the many possibilities for using these creations. Finally, there is useful information on scroll saw techniques and equipment. This is a wonderful book for the newcomer and the old pro alike. your imagination is the only limit. There is also a complete scroll saw blade selection chart and a general stroke per minute blade guide, and some practical instructions and tips from me. All of this combines to make a great book for the novice and the pro alike. I joined with Mark Downing to explore cutting with metals in this book. The process is simple, and with a few extra steps, cutting metal is as enjoyable as cutting wood. And the results are wonderful because metal is pliable, it is possible to give it many shapes by bending it. The finished products include chandeliers and other decorative and useful accessories for the home. With heat or chemicals it is possible to give the metal very interesting patinas that add color and character. All of this is explained in clear, step-by-step instructions, illustrated in color photos. There are also many patterns to get you started and a gallery to inspire you. Copyright � 2002 Pozsgai's Designs All rights reserved.